Ara Pulido, being the leader of Ubuntu Friendly, preferred the first logo and right sticker design from the last set and so do I. As a hopefully last touch, I tweaked the placement of the text on the sticker. As far as I am concerned, this shall be the final artwork for the project, but we will wait for feedback from the Design Team (Edited following Ara’s comment below). The SVG files can be found in the Launchpad branch. The sticker file has an outline on a separate layer; it should only be used for presenting on white ground, not be printed on actual stickers. Thanks for the feedback along the way. especially to those who went beyond just stating a preference for one variation! I just give my opinion as member of the Ubuntu Friendly Squad, not the final decision. Please, update the blog post, as we are still waiting on some feedback from the design team before deciding the logo. which you can adapt. Also I did a couple of sketches which maybe of some use to you. Hello again Thorsten. I showed this to Marcus Haslam (above) yesterday. One interesting things that I think Marcus noted was that both of the above designs have converged to fairly close to the brand templates/constructions on Pages 105 to 109 of the Ubuntu Brand Guidlines (“Creating Brand Extensions”), but mind-out as it is 11MB and 100+ pages. If you’re importing into Inkscape, it’s possible to just load one page but perhaps we should be putting out SVG templates directly. I got a scan of Marcus’ quick sketches from the conversation yesterday (before Marcus drew the examples in the above). I’ve tried to do some example (but these look “a bit finished” and should still just be taken as ideas: uf-badges-sladen-sketches.pdf; Marcus’ original pen sketches are on the left (with smile) and right (approximation of the Page 109 template), but I think you’ve got a lot more flexibility with the “smile” as shown in the PDF linked using UbuntuOne above. Construction for a very similar strap-line template to the above is on PDF Page 105; construction for a very similar badge template is on Page 109. The strap-line template can’t be combined with this variant of the CoF. Uses 2 sizes of the regular font would throw off the current line weights that are shared by the text and the symbol. The badge template has a quite different feel and leaves no room for the circle cutout. Finally, my skills are not needed to just put a different text (one word) into those templates, should such a solution be preferred, leaving me wondering why I worked through this process. Sorry for the delay in replying since yesterday. I think there’s perhaps more freedom than being tied hard to the stems widths in the accompanying type. In the font, while the width of the stems may look optically the same several default widths, each of which vary and taper continuously as the curves progress. With that contraint eased I think it can probably work in the default location. In addition, there is the possibility to apply the varying line-weight to the smile, loosening the rigidity and allowing upcurve and taper into the corners (as you’d see one the italic ‘f’ or the bottom hook of the ‘l’ in the Ubuntu typeface design. Not every design comes immediately, and sometimes, like this Ubuntu Friendly one, it can take a long time… Your skill comes in the details, like the kerning/tracking—which you’ve already done—tweaking the balance, the ratios, the sizing and layout. The Guidelines shouldn’t be a straight-jacket (the Branding Guidelines are guidelines afterall!). You’ve put in a lot of energy, time and effort: sketching ideas, collating ideas. Even better, you’ve dismissed those that didn’t work allowing the final potential to sift through and float to the surface. You’re also 95% of the way there! To add inspiration for that the last 5%, I picked Marcus’ brain again about possible ways to re-arrange the elements in the ubuntu-friendly_art/revision/8 strapline and sticker. 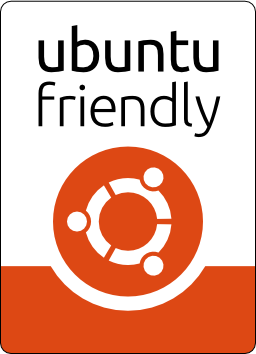 In the following PDF, I’ve tried repositioning the smiling CoF into the normal central CoF position and reduced the size of the corresponding Ubuntu Light “friendly” text to cap-height (kerning per the sticker text). For the sticker itself, Ara expressed a wish for more white/openness and Marcus sketched out a possibility of just using the smiling CoF element already in the strapline and moving that to sticker (added bonus that the two final designs have a common logo between them). Hopefully it’s enough to prove that by exchanging elements from the strapline and sticker, and tweaking the positioning can/should work for your design (plus tapering ends from the font possibility helping to lighten it too).